Cradle Cap (infantile or neonatal seborrhoeic dermatitis, also known as crusta lactea, milk crust, honeycomb disease) is a yellowish, patchy, greasy, scaly and crusty skin rash that occurs on the scalp of recently born babies. It is usually not itchy, and does not bother the baby. Cradle cap most commonly begins sometime in the first 3 months. Similar symptoms in older children are more likely to be dandruff than cradle cap. The rash is often prominent around the ear, the eyebrows or the eyelids. 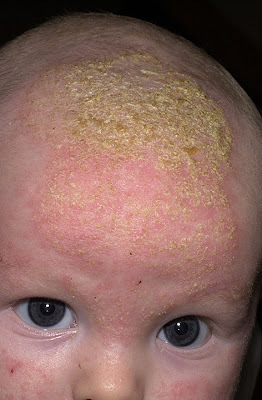 It may appear in other locations as well, where it is called seborrhoeic dermatitis rather than cradle cap. Some countries use the term pityriasis capitis for cradle cap. It is extremely common, with about half of all babies affected. Most of them have a mild version of the disorder. Severe cradle cap is rare. Unlike eczema and other forms of red scaly skin, these conditions are not itchy and shouldn't cause your baby any discomfort. It will improve on its own, but cradle cap can be treated by frequent use of an antiseborrheic shampoo, such as Selsun Blue, and then using a soft brush to remove the scales. Gentle scrubbing may be required to help remove the scale. Persistent cases may require treatment with a low potency topical steroid cream. You can also try massaging baby oil into the scalp and then gently scrubbing with a soft brush to remove the scales.